In the case of Green Street Associates v. Erie Insurance Exchange, PICS No. 09-1737 (Phila. 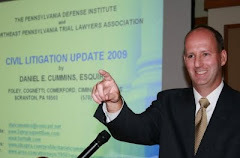 Co. 2009), a Philadelphia County Court of Common Pleas Judge Howland W. Abramson, after a two day bench trial, rejected four policy exclusions relied upon by Erie and ruled that Erie was required to provide coverage for water damage caused to a commercial building by a dislodged PVC pipe. The facts revealed that a tenant in the building heard a loud bang and, upon investigating, found the pipe dislodged from the roof drain it was connected to. Rainwater pouring into the building from the roof. Evidence showed that .19 inches of rain fell over the 18 hours prior to the event but there was no rain falling during the 7 hours leading up to the event. Erie insured the premises under an "Ultrasure Policy." The carrier sent out a forensic engineering expert to investigate on two occasions. He noticed rusting of the pipe and Erie initially denied coverage because the loss was caused by a drain fastener rusting away and, therefore, the loss was deemed to fall under the wear and tear exclusion. Erie also initially relied upon the rain exclusion. By the time of trial, Erie also asserted that the loss fell under surface water exclusion and the deterioration exclusion as well. Judge Abramson ruled that Erie failed to sustain its burden of proving the applicability of any of these exclusions. The rain exclusion and surface water exclusions were found inapplicable because it was not raining at the time of the loss. The remaining exclusions were also found inapplicable because, according to the Judge, there was no credible evidence that the stain on the pipe that became dislodged was rust as alleged and there was no credible evidence to show that the pipe became dislodged due to the rust or other wear and tear. Anyone desiring a copy of this case may secure one from the Legal Intelligencer by calling 1-800-276-PICS, giving the PICS Case Number noted above, and paying a small fee. I thank Attorney Gerry Connor of the Scranton, PA office of Margolis Edelstein for bringing this case to my attention.